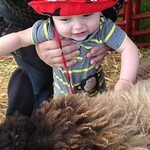 Last weekend was the Kentucky Sheep and Fiber Festival. As part of my ongoing driving practice, we went to the festival via North & Lime. The drive was uneventful, and we got to the festival early. 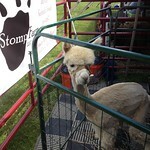 After going through the vendor section, we made our way through the animal tents and saw all of the sheep, goats, llamas and alpacas. We saw some angora rabbits, though most of those were in the vendor area, usually next to one of the people spinning away. I don't know if Q is going to like this enough to go annually, but it was cheap family fun ($3/adult). 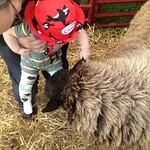 He got to go into the "Hug a Sheep" pen and pet the very tolerant sheep, and came away with a tiny fistful of crimped fibers. The only thing that could have made it even better is if North & Lime had a vendor truck there. I came home with 3 skeins of yarn all named after female scientists. Two are shockingly neon pink and are named after Marie Curie. It just seemed too appropriate.